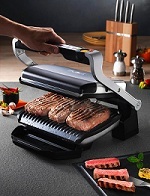 The most exceptional feature of this indoor electric grill is that it gives you six cooking programs: burgers, poultry, sandwiches, sausages, red meat and fish. Its unique sensor automatically adapts its cooking time to the thickness of the food. How do you like your meat? Rare, medium or well done? Just choose how you prefer and it will alert you by beeping. You don’t have to stand in front of the counter top grill all the time. 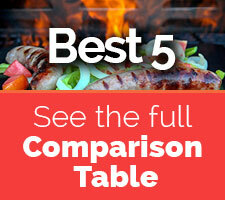 As it’s a smart indoor electric grill, it will let you know when your food is ready. This indoor electric grill also features a defrost setting for cooking food from frozen and a manual setting for vegetables and personal recipes. The plates are removable and dishwasher safe. This inside grill is easy to clean. Its grill plate is angled so that fats can be released and can be stored in the drip tray. All these features make you work less and give you a delicious taste. 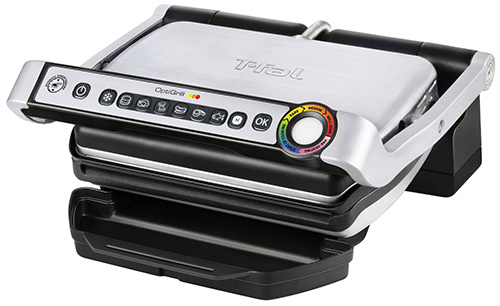 The T-fal GC702 OptiGrill Indoor Grill has some features which makes it unique from others. With this indoor electric grill, you can cook any types of food. There is already six options for cooking. You can cook other foods by the manual function. 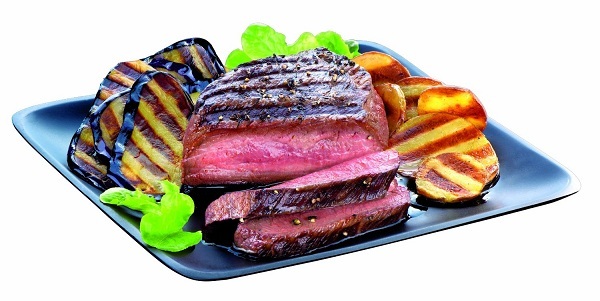 This inside grill will help you to have versatility in your cooking. You will have to select which one you want to cook then you will have to give it some time to preheat. Close the lid during this time. If you open the lid then it will go to the manual function and everything will be confusing. It will beep when it is preheated and then put your food. Most of the works are done by itself by its buttons and sensor. If you want the control over your hand, then go for Breville Smart Grill. If you want your food to be medium, it will let you know when it is cooked medium. You don’t even have to set any timer. It will automatically cook your food till the perfect time. So basically, with this indoor electric grill all you have to do is to choose which food you want and how (rare, medium or well-done) you want it. The rest of the work will be done by the smart grill. Another unique thing of this indoor electric grill is, the plates are angled for fat release. So your kitchen doesn't get messy and all the grease store in the drip tray. 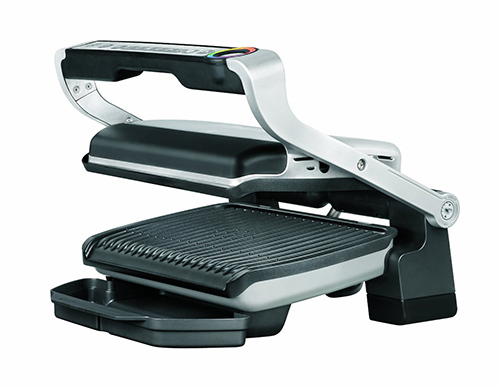 If you want to control the temperature of the upper plate and lower plate separately, then go for Cuisinart GR-150 Griddler. With all these magnificent features, the indoor electric grill also gives you the experience of easy cleaning. Normally cleaning all these fats and grease is a hard task. But not for this inside grill. The plates are really easy to remove. The plates are non-stick. So dirt comes off easily with dishwasher or by hands. If you have a dishwasher then just put the parts in the dishwasher. If you don’t prefer dishwasher then first clean them with soaked towel and wash them soap. ​As thisindoor electric grill already gives you six cooking options, you can cook them as well as different kinds of foods. The grill gives you 6 cooking programs and 2 cooking modes. The foods which we usually cook at indoor grills are already in the cooking programs. But if you want to cook different foods or your personal recipe, you have the manual function. You can control the whole grill if you want to. Again if you want it to automatically cook your food, then just go for the six cooking modes. It gives you the opportunity to cook the way you want to. The features of this T-fal indoor grill are quite different from others which make it so worthy to buy. The price of this grill is a bit more than the average price. But you will not regret once you buy it. 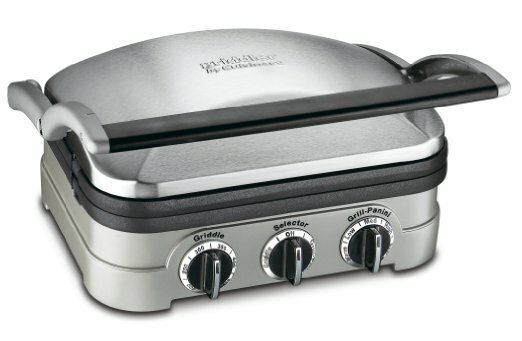 If you are finding a cheaper one with different functions, then go for Cuisinart GR-150 Griddler. However, T-fal is best suitable for the people who have less time to cook or those people who like things done automatically. This smartly designed indoor grill works as your friend who knows the taste of you and your family and cooks the way you want to. Buy it and feel the difference! To compare other products, click here.